This month marks the 2nd birthday of Cooking With Janica! I have to say, it was quite a year…. ‌• We went “viral”. These cute, tasty, and alcoholic little bears put us on the map. They were so popular that the traffic crashed our website, causing mass panic and a few anxiety attacks. We came back swinging though and the video has now reached MILLIONS of people and just keeps going. ‌• We had the opportunity to travel to Iceland and experience fun new foods and flavors while taking in some of the most beautiful landscapes and scenery we’ve ever seen. ‌• We became profitable! While the numbers are still small, we officially started turning a profit a few months ago. If you’re into that sort of thing, we began publishing income reports. Looking back, we made quite a few tasty creations. All of them were great but these hold a special place because we’d make and eat them every day if our metabolism would allow. This year also marked the first time I’ve ever attempted to make a macaron from scratch and it didn’t turn into the disaster I was expecting!!! Hooray!! 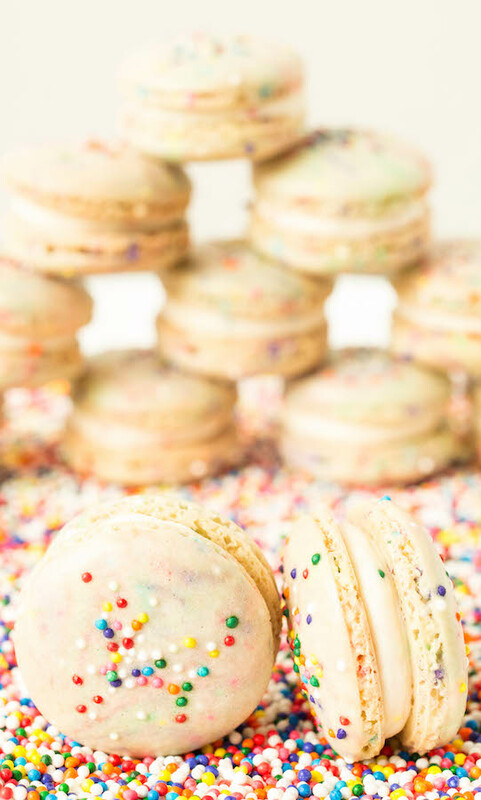 Jess loves sprinkles and these macarons were bursting at the seams with them so needless to say, they had to be made to celebrate our birthday! I followed this recipe from Sweet And Savory By Shinee and they turned out perfectly! All in all, this has been an exciting year for Cooking With Janica. We look forward to creating some amazing and delicious recipes for you all in 2017! Stay tuned! In a bowl, sift together almond flour and powdered sugar (the almond flour I bought was super-fine so I only sifted once. If your almond flour is not of the super fine variety, sift twice). Set aside. In a standing mixer with the whisk attachment or a hand mixer, beat the egg whites on medium until foamy. Add cream of tartar and continue to mix. Slowly add sugar, one tablespoon at a time, increase speed to medium-high and beat until hard peaks form. Then mix in vanilla extract completely. Setting the whisk aside, pour flour and sugar mixture over the egg mixture and gently mix the two together with a spatula. It’s best to mix by running the spatula clockwise around and then through the middle of the batter over and over again. Mix until the batter has become thin and lava like (You do not want to over mix the batter. This will lead to cracked macaron shells. The batter is ready when you drop a sample of it and the ribbons of the drop dissolve within 10 seconds. This may take a couple attempts). Once the batter has been mixed enough, add in sprinkles (The more you add at one time the greater chance of the sprinkles bleeding which doesn’t have to be a bad thing. Bleeding sprinkles can actually make the macarons look pretty fun. But again, try not to mix the batter any more than you need to at this point). On a baking sheet lined with parchment paper or on this macaron silicone mat , pipe the macaron batter from a piping bag or gun into 1.5 inch circles. Tap the baking sheet on the table a couple times to cause any air bubbles in the batter to be released (Any air bubbles will also cause the shells to crack). Top the shells with more sprinkles. Pre-heat the oven to 300 degrees while you let the macarons sit for 15-30mins. You want the shells to harden up. After 30min if you touch the shell and it doesn’t stick to your finger, it’s ready to bake. Bake the shells for 18-20min. Cool on a wire rack and then remove from parchment paper or silicone mat. 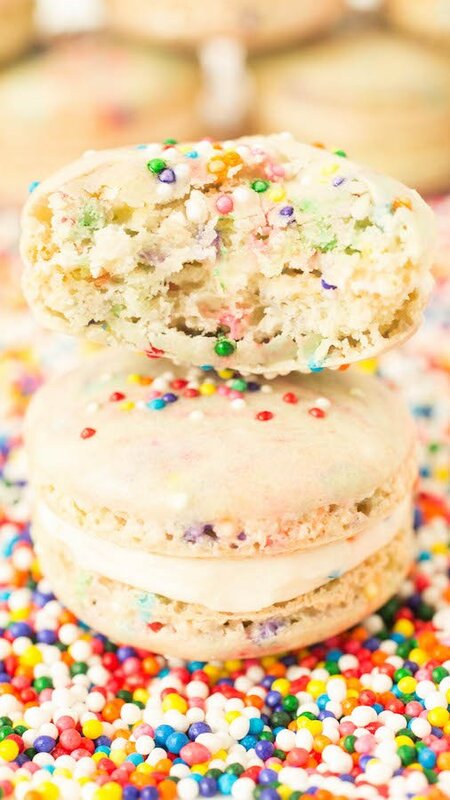 While the shells are cooling, make the funfetti white chocolate buttercream. In a bowl whisk together the butter and powdered sugar until fluffy. Melt the white chocolate in the microwave and add to the butter and powdered sugar mix along with the vanilla extract. Mix thoroughly. Once complete add in sprinkles and stir with a wooden spoon or spatula. With a piping bag or gun, pipe icing onto half the shells and top with the other half of the shells. Celebrate by eating one or two….or more…. Congrats on going viral! It sounds like you’ve had a busy year. I haven’t yet tried making macarons but maybe one day! These look delicious and I love that you use almond flour. Thanks, Elaine! We were intimidated by the macarons at first but they’re not as complicated as one might think. I love all the different possible flavor combinations! Congratulations on year 2! I’m so proud of y’all and always love sharing your delicious and beautiful recipes! I’m going to have to try this macaroon recipe as I’m planning a macaroon of the month for 2017!! Happy 2nd year blogging! And congratulations on your new achievements! That is awesome! 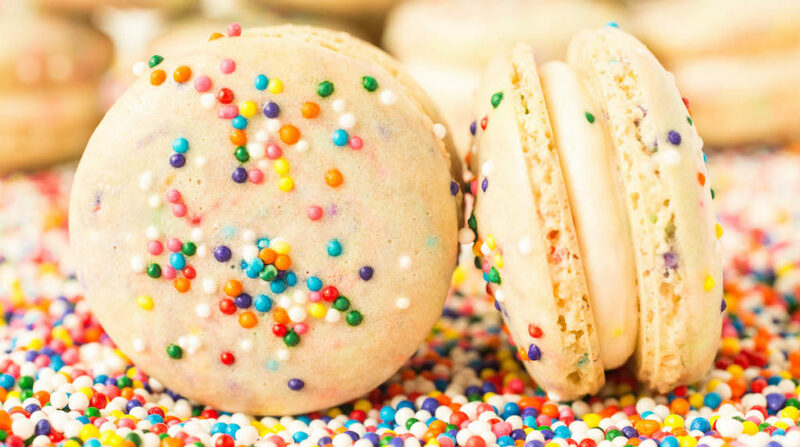 Like these adorable funfetti macarons! Oh my goodness I love these!! These are so super cute! I’ve been tempted to make a macaroon recipe since my friend from France introduced them to me!! Love this! Thank you for sharing this! These look so happy!!!! I love them!! !